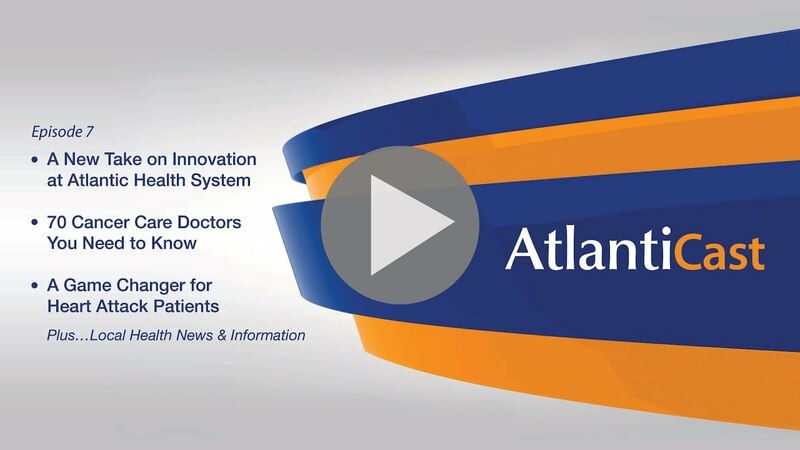 On this week’s AtlantiCast, you’ll see how Atlantic Health System is driving innovation and finding new ways to solve tomorrow’s health care challenges, find out how a near tragedy on the tennis courts was averted thanks to some world-class training and technology at Chilton Medical Center and meet the 70 cancer doctors you need to know about – plus much more! Atlantic Health – Advancements AHa! new innovation to the world. to save a life at Chilton Medical Center. of the week's top headlines at Atlantic Health System. to solve tomorrow's health care challenges. and 16,000 member army of innovators. and its workforce, and it's already working. in a more efficient way and improves safety. by those who are on the front lines of patient care. to excite them around the possibilities of their thoughts. There's nothing impossible at this point. To learn more about AHa!, go to AtlantiCast.org. from Pompton Plains after he collapsed on the court. when it can't do so itself. and discharged with no neurologic damage days later. technology, and care to patients throughout our system. Mr. Delart is now back on the courts. but no one should have to face a diagnosis of cancer alone. vast network of cancer care services. To request a copy, visit AtlantiCast.org. Everyday is an opportunity to raise awareness about stroke. and educational materials as part of World Stroke Day. as part of an open house in the Bouras Auditorium. and guests took a tour of a giant inflatable brain. and other officials for an anniversary celebration recently. and here's to the next ten great years. here at Atlantic Health System. after she was diagnosed with thyroid cancer. and is now getting her master's degree. here's a look at some of the events coming your way. for this year's Chilton gala. Take a look at some the night's action as we go to a break.